The Magazine of Spiritual Education. Chicago, IL. Publisher: Spiritualistic Educational Association. Editor: Lloyd Kenyon Jones. 1/1, March 1920-1921. 64 pp., $2.00 a year. This was the work of Lloyd Kenyon Jones (January 9, 1878-June 28, 1941), a versatile and long-lived promoter of dubious schemes. He was a sometime journalist who during his career promoted wrestlers and motion pictures and then mining and oil stocks, betraying in the latter a little too much familiarity with the current get-rich-quick stock schemes. He was said to have been raised a spiritualist, and in his youth he subscribed for the lessons of Herbert A. Parkyn's Chicago School of Psychology (on which see the note under Suggestion) on hypnotism and suggestion, and initially took to the road locally as a hypnotist and mentalist. In 1900 he wrote on telepathy for Sydney B. Flower's Suggestive Therapeutics of Chicago, the competitor of Parkyn's Suggestion (Flower had been Parkyn's publicist). Flower, on whom see the note under New Thought (Chicago), was the king of the New Thought / Success promoters and seems to have taught Jones the finer points of the trade. In January 1901, Jones started his own Journal of Magnetism in Chicago, "devoted to Physical Culture, Magnetism, and Health," but with the second issue in February the journal was "merged into" Flower's Suggestive Therapeutics, assuming that journal's volume numbering (v. 10, no. 2). This merger seems to have been Flower's way of dealing with his loss of his bulk-mail privilege because of the fraudulent advertising carried in Suggestive Therapeutics, and the scheme was short-lived. In December 1901, with new financial backing, Flower started New Thought (Chicago), assuming the volume numbering of Suggestive Therapeutics, beginning with vol. 10, no. 12. Jones later claimed d to have been "originator and first editor of ‘New Thought' of Chicago," though he nowhere appears in the journal , but whatever the truth of the claim he had insinuated himself into Flower's enterprises. He was at one point head of Flower's Psychic Research Company and Magnetic Publishing Company and was the copyright holder of Flower's famous "Series" lessons – Series "C" (Clairvoyance or Crystal Gazing, Personal Magnetism, Auto-Suggestion, etc.) and Series "D" (Psychometry, Phrenology, Palmistry, Astrology, etc. ), the second of which was republished under Jones's name in 1906. By May 1901 he seems to have gone off on his own with a Chicago School of Psychic Attainment, offering the wonders of "Autoism, the Science of Self" (6 lessons for $5.00: "There is no poverty, there is no fear, other than that originated in the mind of man"). A few years later, Jones surfaces in Colorado as a wrestling promoter and mining and oil entrepreneur – until accused of fraud by his shareholders. After World War I, he took up with a Mrs. Cecil M. Cook, a medium, to run the the "William T. Stead Memorial Center" in Chicago, an enterprise that sold personal development and success lessons (from "Our Teachers") and provided personal spirit readings by mail. The two went their separate ways when Jones started this journal in 1920, although Mrs. Cook wrote regularly for the journal. Mrs. Cook (Ellen Augusta Svenningsdotter, 1877-1945) continued to sell her own monthly lessons and headed her own "Stead Center of Soul Communication," and eventually fell afoul of Harry Houdini's investigations. The advertisements for this journal harkened back to the glory days of yore when "every family had its medium" and urged readers to "Find Your Mediumship" by seeking "Your Open Door that will help YOU do the Right Thing to Find How YOU May Communicate with the Loved Ones in Spirit." 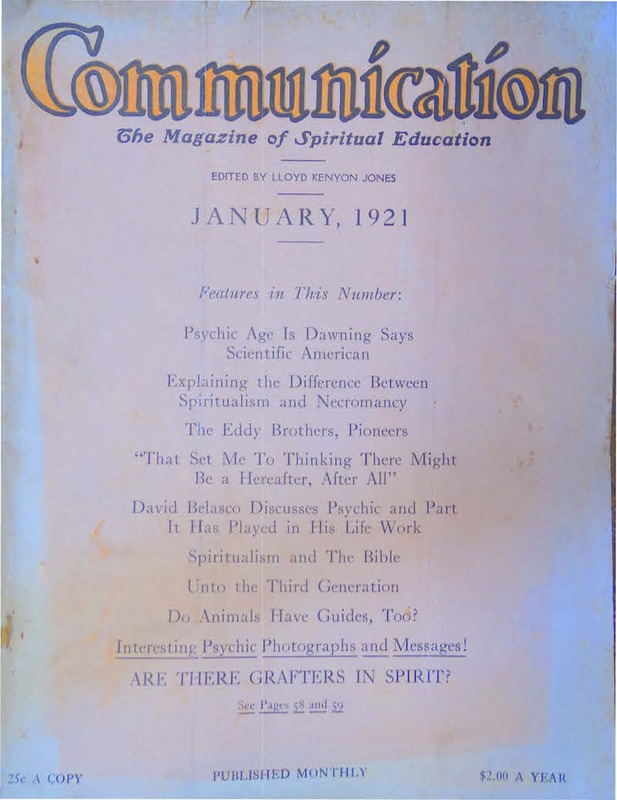 The door was opened by Jones's monthly lessons on "Clairvoyance, Clairaudience, Psychometry, Crystal-clairvoyance, Impressions, Written Messages, Physical Manifestations, and Many Other Avenues of Spirit Communication" -- all helpfully sold with the necessary accoutrements through Jones's Spiritualistic Educational Association, which also published the journal. The journal seems to have prospered for a time -- Jones told people whose subscriptions were expiring that 35 people worked in the office (and enclosed a "Message Request Form" that for $5.00 would entitle the subscriber to a personal message "from loved ones in spirit"). The journal was a mixture of spiritualism with exhortations on success and mental uplift, with articles by Jones and Cook, and Mrs. M.E. Williams, and by a host of unknown authors like Ollah Toph, whose novelette was serialized in the journal. She was an Indiana poet who wrote the then-well-known"The Heart of a Boy" ("Boy! With the heart of a man, I love you || Your youth, your dreams and the infinite grace," etc.) It also featured poems by "Snowdrop" ("Plucked by Snowdrop") and a regular column by "Pink Rose's" "A little Chat with Little Ones." The journal featured articles on "Spiritualist Phenomena of 40 Years Ago" (copied, with the illustrations, from Miller's Gallery of Spirit Art), "Life of James ‘Farmer' Riley," "Our Alice, Brooklyn's Remarkable Child Medium" (who communicated poetry), and, perhaps driven by lack of manuscripts, serialized a long piece on "Captain Bonavita," the lion-tamer. Above all, the journal carried full-page advertisements for its "Club Offers" and for Jones's lessons and spiritualist paraphernalia like tin trumpets and the Automatagraph ("a Psychic Battery – insulated but on the right lines to Accumulate and Control the forces"). The journal also touted its own "Health Ticker" ("similar to the ‘stock ticker'") that would "forecast your earning-power, your happiness, the degree of your love for others and their love for you, the extent and value of your business and social friendships -- and your success along the line of your fondest ambition." (Price sent on request.)" The publisher of the journal, the Spiritualistic Educational Association, was a full-service spiritualist criminal enterprise, as was made clear in an "Open Letter Concerning the Spiritualistic Educational Association" sent out by disgruntled spiritualists and investors after Jones sought refuge in bankruptcy in September 1921. The Association sold by mail: "books, ouija boards, itongo boards, automatagraph[s], aluminum trumpets, oriental lessons at $10.00 per, which were a travesty on the beloved ones of the Spirit World; a ‘Keep Well' Club also at $10.00 per . . . and last but not least, (the crowning insult to this great psychic force that envelopes us) a chemical in lamp black that he sold for five ($5.00) dollars a box (costing him a few cents) with instructions how everyone who wished might open the doors to the invisible world and communicate with those who have passed on." Not satisfied with this, the Association also sold its own bonds ($200,000, offering a 6 or 7 percent coupon) for funds to promote this journal, and helpfully offered to exchange its bonds, presumably on favorable terms, for Liberty Bonds. Jone's bankruptcy petition listed $140,000 in debts and assets of $374, and he testified to having taken in $350,000 in one year. The journal was discontinued despite an offer to buy and continue it because, as the authors of the Open Letter claimed Jones told them: "I would see it in h___ first. I am sick of the Spiritualists. They are all hypnotized fools." Not content with this, Jones declared that "there were no honest mediums" -- naming names of local practitioners -- and set out for Texas. Perhaps sensing the coming collapse of the journal, Jones tried raising money (at 7%) to start another journal, Popular Psychology, that would carry articles on the wonders of psychological research being carried on at all the leading universities. Nothing seems to have come of Jones's solicitations for support. Jones appeared in California in 1925 where he was indicted in connection with the fraudulent promotion of the Owenwood Oil Corp. (he was Publicity Director), and then appeared in the 1930s, in Deadwood, South Dakota, promoting investments in precious metals. In 1935 he was announced as editor, appropriately, of Mail Order Journal ("for those interested in mail order sales and advertising methods"), and in 1938-1939 he was conducting "Your Mystic Council Chamber" department in True Mystic Science, trying to lure the magazine's subscribers to start their own Registered local Council of students under the tutelage of the international Chamber. The same journal also carried advertisements for his pamphlets (the "Finger-Tip Library"), for 35 cents. LOC; Skidmore Library, Lily Dale.